Congratulations to Susan, the winner of the Origami Flowers giveaway. I hope you're enjoying the book! Ok, I'm back now, it's just awfully distracting. How long did it take you to stop browsing the link and come back to read the review? Felt mascots, toys appliques and accessories, all of them super cute. The projects are wonderfully photographed. Like a lot of Japanese craft books, the first part of the book is photos of items, with the instructions in the back of the book. Page numbers are given on the photos to find the instructions. The photos are adorable. They are captioned and done on good backgrounds to show them at their best. It takes minimal supplies to make them. Craft felt for beginning sewers is an economical choice, then switching to wool felt for a higher quality finished item when you're comfortable with the hand stitching. The projects are good for a wide range of skills. There are some very easy applique projects, coasters and pouches which are perfect for beginners. They are whimsical and sweet. The Happy Coasters include a fish, a frog face and a chick, with easy embroidered accents. You might like to make the pouches and eyeglass cases as gifts. A little more complicated are the lightly stuffed but still mostly flat Face Brooches, which are a bunch of cute animals and can be made with small scraps, the finger puppets and the charms which are strung with beads into darling hanging curtains. My favorite of those types of projects is the Little Forest Birds charms because it reminds me of the felt ornaments my Great-Aunt Elizabeth made. The most complicated are the fully dimensional stuffed toys. These are more of a challenge because it's a small scale, but they are made using the same basic stitches, just more parts to create things like a giraffe, elephant or posable retro dolls that look like they came right off the set of an old stop motion movie. There are also dolls like Miss Kitty from the cover that have a full wardrobe you can sew for them. Some of the patterns you'll copy out of the book, the more involved patterns are printed on the inside of the dust jacket. The diagrams in the instructions are clear and show how to put the items together. 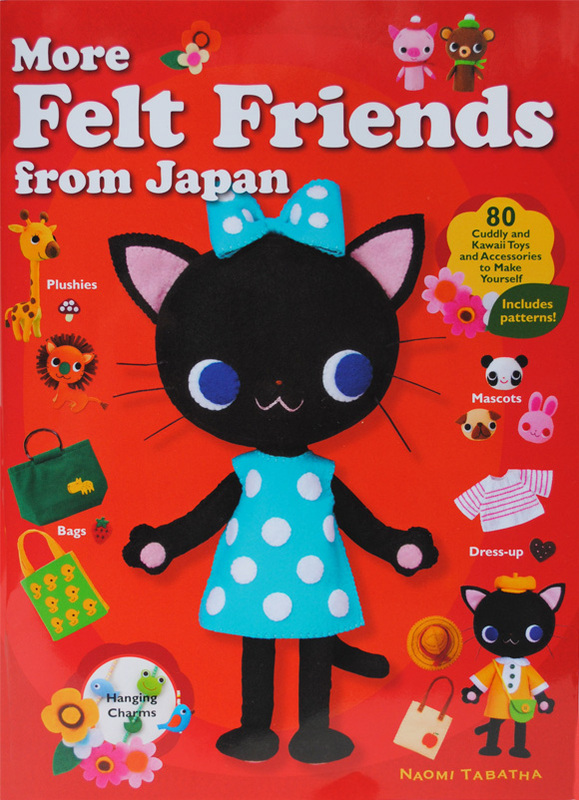 This is a lovely book, and a must for anyone who really enjoys Japanese crafts. Kodansha USA gave me an extra copy to give to one of my readers! Giveaway is open to people in the USA only because of shipping costs. I love making stuff with felt! I made an Ugly Bat for my cousin and she loved it! I made a Pooka Doll for my granddaughter for her birthday once, and a gingerbread girl for her and her brother for xmas! I'm getting a question that says: "Which animal do you want to make out of felt?" Hmmm...that giraffe looks pretty darn cute. I would be all over making felt cats! !